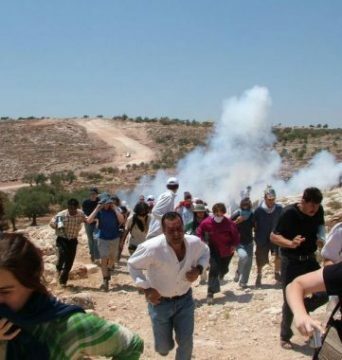 Israeli soldiers attacked, Friday, the weekly nonviolent procession against the illegal Israeli Annexation Wall and Colonies, in Ni’lin village, west of the central West Bank city of Ramallah. The soldiers attacked the nonviolent procession with gas bombs and concussion grenades, just as the protesters reached Bawwabat al-‘Asfour area, causing many to suffer the effects of teargas inhalation. The protesters, accompanied by Israeli and international peace activists, marched carrying Palestinian flags, and chanted against the ongoing Israeli occupation, and military escalation, in addition to calling for national unity. The protest also marked the 17th anniversary of the death of the senior political leader from occupied Jerusalem, member of the Executive Committee of Palestine Liberation Organization (PLO) Faisal al-Husseini.